on St. John's south side. 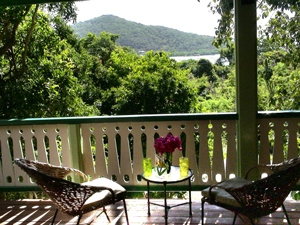 sits In the valley within sight of serene Fish Bay. listen to the island come awake. with a book or just nap. a covered deck, wraps its way around three sides of this home. 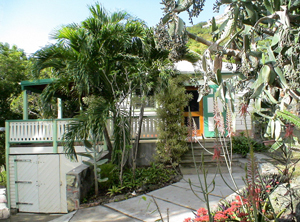 There is plenty of room inside and outside to enjoy a variety of activities. cabinet maker and has beautiful mahogany wood work throughout. 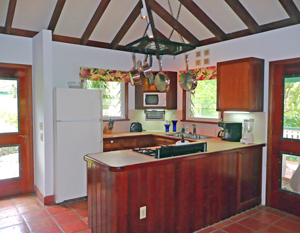 Lots of windows, mahogany french doors, and tile floors create an open, cool and comfortable interior. There is a large television in the living room with cable and DVD. There are telephones and an answering machine, and the cottage has DSL. and both rooms have ceiling fans. Beach chairs, beach towels, coolers, umbrella, masks and snorkels are provided. The large bedroom has a king size bed, and air conditioning. Open the mahogany shutters between the living room and bedroom and you can lie in bed and watch TV. that is open to the stars. coffee maker, toaster oven, and refrigerator with ice maker. outside the kitchen door, and a washer and dryer are located downstairs. 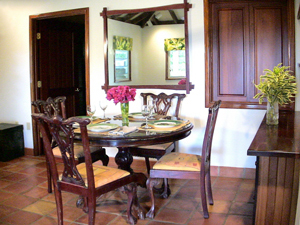 Cactus Flower Cottage is very private and shares the property with the owner's home. 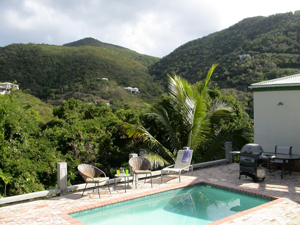 Guests have full use of the pool on the deck of the main building. 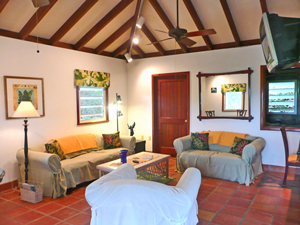 Cactus Flower Cottage is 2.5 miles from Cruz Bay on a paved road. 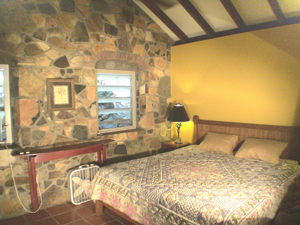 Cactus Flower Cottage will sleep two very comfortably.